John Long of SFT is averaging over 30 ppg in 2018-2019. John Long grew up in Carbondale, a town of 1,336 people, 26 miles south of Topeka. Long’s parents, Jim and Kim, put John in a recreation basketball league in Topeka when he was young. John quickly fell in love with the sport. He often shot at a neighbor’s basket, and then started to work at home when Jim built a goal for John, his older brother, Josh and their younger sister, Jaycee. Three years ago, Josh was part of a senior class at Carbondale-Santa Fe Trail, a school not traditionally known for basketball. John was a freshman, and the seniors wanted him to play varsity. However, the then-SFT coach didn’t think John was ready and had him on the junior varsity. The next year, Thatcher Decker took over the Charger program. Long set a goal to hopefully average around 10 points a game. A senior was expected to carry the bulk of the scoring. Then, in January at the Royal Valley Panther Classic round-robin, Long, a shooting guard, set a tournament record with 33 points. “I felt like ‘Wow, I can really score the ball’ after my Royal Valley tournament,” Long said. Decker and Long had a conversation after the competition. Decker’s encouraging words have propelled Long to among the state’s top scorers and created one of the state’s biggest turnarounds, regardless of classification. Long finished his sophomore year with 18.8 points per game for all league and honorable mention all-state. SFT won just four games and started a sophomore quartet. Three still start: Long, Will Herren and Gabe Dunnaway, and the trio are the team’s key players. Junior Andrew Berckefeldt and sophomore Maddox Decker are big contributors. Santa Fe Trail finished 14-8 last winter as Long collected 26.8 points a game for all-state second team. It marked the program’s first winning season since 2010-11. This year, the Chargers started the season unranked in Class 3A. Currently, Maur Hill and Santa Fe Trail are the only undefeated teams in Class 3A boys and ranked 1-2 respectively in the latest poll released Monday. 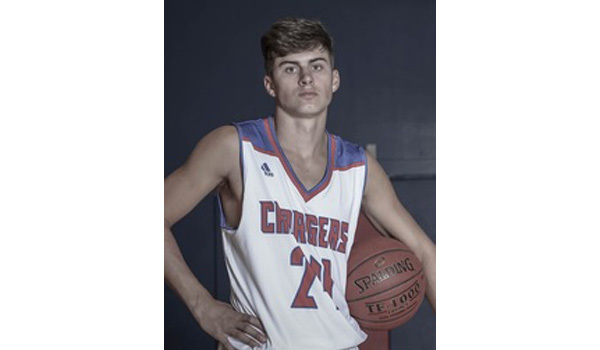 The 6-foot-2 Long, also helped by a strong work ethic and his family, collects 29.5 points per game and has led Santa Fe Trail to multiple close, marquee wins. Long said his greatest career achievement has been turning around the Charger basketball program. SFT has made just two state appearances, in 1996 and ’97, according to Kansas historian Carol Swenson. The Chargers captured the 4A title in ’97. “We just really came together with coach Decker and realized how good we could be, so by the time we were seniors, we knew what was expected of us,” Long said. In December, Long had 46 points against Metro Academy in a 70-67 victory in the Ike Cearfoss tournament championship game at Central Heights. He collected 32.3 points a game in the tournament and cleared 1,000 career points. Long was a point away from tying the single game scoring mark. Currently, only Arkansas City senior Cevin Clark (31.1 points/game) averages more points than Long, according to the MaxPreps statewide list. SFT owns narrow wins versus Osawatomie (74-64), at Burlington (46-42), at Wellsville (66-63), versus Anderson County (62-58), versus Royal Valley (54-46), versus Chapman (53-49) and at Osage City (47-37). Last year, in a similar stretch of games, Santa Fe Trail lost to Burlington by three in overtime, Wellsville by 13, Anderson County by nine and two, Chapman by 14 and Osage City by four. Last week, Burlington is currently ranked ninth in 3A. Chapman was ranked No. 10 in Class 4A in mid-January and has lost just twice. Anderson County has dropped just four contests and opened the season No. 6 in 4A. Long said he was most pleased about the AC victory and against versus rival Wellsville. Before the season, Long said Santa Fe Trail had seen some social media words from AC that provided fuel. Long, who has a 32-inch vertical with a 205-pound bench and 315 squat, credited his family for helping him. His mom graduated from Topeka West, while his dad is from Carbondale. Jim works for Canon in Overland Park and drives 140 miles round trip a day. Jim has accompanied his son on college visits and has played a significant role in the recruiting process. When he was younger, John often played basketball with Josh, an excellent baseball player who went to Highland Community College, and his friends. They helped form toughness with John. “They would always just beat me up on the basketball court, but it was for the best,” John said. John’s sister, Jaycee, is a ninth grader and possible prospect. John said Jaycee averaged more than 30 points a game in junior high and delivered 45 points one game. She tore her ACL and isn’t playing basketball this season but is expected to return next winter. However, like many of Kansas’ recent top scorers from small schools, Long has received muted interest from Division II colleges. Long has had strong contact with multiple NAIAs, including Ottawa, Kansas Wesleyan, Bethel, Bethany and Benedictine, among others. Long said coaches at Emporia and Washburn expected him to be a JV player for several years. In the last three recruiting classes (’15-16, 16-17, 17-18), Kansas had 24 senior boys average at least 20 points a game, according to MaxPreps statistical lists. The bigger school players, most notably McPherson’s Ben Pyle, Wichita Southeast’s Jerrick Harding, Derby’s Nyjee Wright and Maize South’s Payten Ricks, signed with Division I/II programs. Harding has had a great career at Division I Weber State, Wright is a key backup at Division II Fort Hays, and Ricks averages 12 points a game for Division I Abilene Christian. Pyle is playing for Division I Western Illinois. Some of the smaller class standouts, including Atchison’s Wykeen Gill (Kansas State wide receiver) and Beloit-St. John’s-Tipton’s Davis Dubbert (Wichita State track) are Division I athletes in another sport. However, the smaller school high scorers have generally went junior college, NAIA or didn’t play in college. For Division II, Jackson Heights’ Zane Richter was listed for two years on the Washburn roster, but never appeared in a game. Southeast of Saline’s Easton Montgomery was on Missouri Western’s roster but also never played. Several players who fit Long’s profile, like Fredonia’s Isaac Ostrosky, Lakin’s Diego Davila, Humboldt’s Rayce Hoepker, and Caney Valley’s Baylor Melchiori, enjoyed outstanding high school careers. Like Long, they turned around programs. Ostrosky, Davila and Melchiori all led their high school teams to at least an eight-win improvement in their senior year. Davila is at Colby CC, Hoepker at Allen County, Melchiori is at Kansas Wesleyan and Ostrosky plays at Sterling. I have been playing from the time I could walk and always competed with my older brother and his friends. Help my team win a State Championship. We have the talent to make a run if we play well and as a team. My shooting ability and desire to WIN! Loud and Proud of our performance. We get up and down the court and play at both ends of the court with an attack style. Strength – Shooting and Creating Shoots off the dribble. Weakness – I can always improve my Defense. All have their individual role – However we have a great shot blocker in Gabe Dunnaway and a great defensive player that guards the best offensive on the opposing team in Will Herren . Winning and knowing that your hard work during the off season will reward you in the long run. Loved playing Football and Baseball but I realized if I wanted to play at the next level I needed to play Basketball year round. Great – He works us hard in practice and it is paying off in games. We have a Summer League for High School Basketball for the entire team but I play AAU for SSA during the off season. I have a lot of College Coach’s texting me and emailing me with scheduled visits to Campus at this time but I haven’t decided which School I will attend yet. My goal and plans have always been to play at the next level. Business Management or Education and Coaching.